Unifi is the UWA wireless network for all University staff and students. Where can I use Unifi? To find out if a particular building or area of campus is wireless-enabled, check the Wireless Coverage Map. Note: buildings listed here as wireless-enabled may have particular areas where reception is weak or unavailable due to building layout, type of construction, or other factors. This resource is provided as a general guide and does not guarantee that a wireless signal will be available in all areas. How do I use Unifi? Staff and students authenticate to the Unifi wireless network using their Pheme credentials. have instant access to the wireless network. There is no requirement to apply, register or create an additional account. Access is provided as soon as their Pheme account is registered. have immediate access to the wireless network once their Pheme account is activated and they have agreed to the terms and conditions of internet access - done by choosing the 'change internet access' link in Pheme. Most modern laptops, notebooks, PDAs and smartphones are compatible with Unifi. All permanent and Category 2 staff are entitled to access EMS computers once they have activated Pheme. For help, visit Staff Pheme Activation. If you are having issues logging in to your computer please contact your local IT support office who will be able to assist you. For help, visit Student Pheme Activation. If you are having issues logging in to your computer please contact your local IT support office who will be able to assist you. 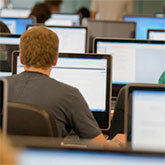 For security reasons it is important that you do not leave any personal items unattended in any computer lab. EMS IT staff perform regular lab checks and any items that appear to have been left behind will be taken to the nearest IT Support Office. Almost all software used in the CSSE teaching program is available for School staff and students to download via Dreamspark. To create your Microsoft Dreamspark account you will need to register using your UWA staff or student email address. All other software (freeware for Linux, Windows and Mac) can be downloaded from the CSSE software server. The software download server for freeware can only be accessed from within CSSE. Please refer to the link for a list of all software installed in EMS computing labs here.